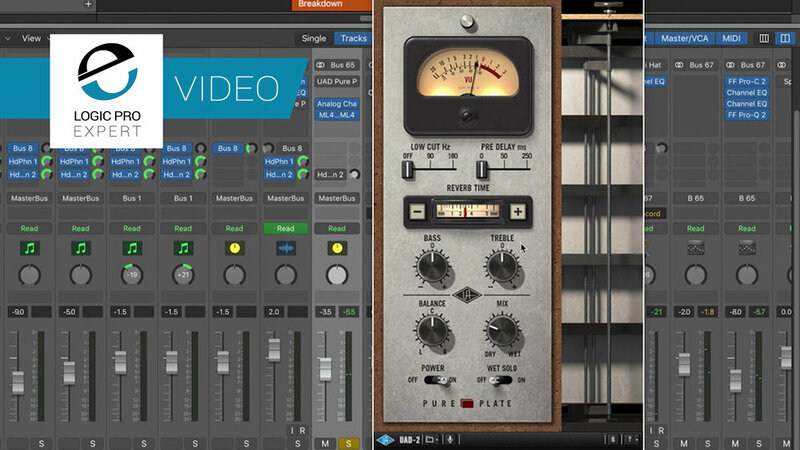 Universal Audio’s Pure Plate Reverb (€149,00 ) is simply a joy to use. The user interface is dead simple; there’s no secret handshakes or hidden alleyways to go down. What you see is what you get. Also, it’s a fantastic sounding vintage style plate reverb. There is a simple two-position lo cut at the top of the signal flow to attenuate unwanted low end from reaching the plate. The pre-delay is a simple dial. I like that there is no numerical readout of the values; it forces us to use our ears. The actual plate size can be adjusted either from the main dial, the +/- buttons, or the plate reverb graphic on the right. The post reverb signal EQ features a simple bass and treble control. Universal Audio has included a Balance knob as well; which is a very welcome function, enabling us to subtly (or not so subtly) shift the reverb around in the stereo spectrum. A dry/wet mix knob rounds out the intuitive interface. In this video, sponsored by Universal Audio, I’ve put the Pure Plate reverb to work in a variety of musical contexts; and it sounds great in all of them.